miss~nances life: UFO challenge list & the long awaited giveaway. UFO challenge list & the long awaited giveaway.
. I also added 5 new projects and a few unfinished fundraiser items tot he list. After compiling this list I knew i gad to come up with a plan to get at least a few projects made. So I started with the project with the least needing doing and that is the pictured Violetta table runner. All it needed was its binding sewn, I stayed up all night Monday 2nd January to finish it. AND to celebrate I have decided to make it a giveaway. Leave a comment on this post for a chance to win. Don't forget to leave me a way of contacting you. I will leave the giveaway open until Sunday 22 January. Now back to my plan to wade through my UFO list. I have purchased 7 pretty boxes and have sorted all my projects out into categories ie table runner, bags etc ( my quilts have been living in a crate for the last few years and are still there in the linen press). My next plan it to take one item from each box that has the least work to do and start there. At the moment I have a fig & plum table runner in my work basket behind my night time chair, I am 1/4 way through the hand binding. For the quilt tops I have a friend who has a long arm quilter machine that she allows you to go and quilt your own for $10 an hour so I am planning to book in every two months to get my quilting done, hopefully I can bind each quilt in the months between. The double bed quilt I want professionally done but seeing as my son has moved back into what was the spare room and that quilt was for that bed there is not so much of a hurry to have it done. When one of my kids plan to move out I might do it then. Congrats to you on all the "finishes"! The table runner is lovely! Wow - that is quite a hefty list - but I think your plan of action is good - I am waiting to see your finsihes - love the pirple / violet runner - just love purples. I like your plan of separating projects by type. I'm trying to work through my list by doing a few quick finishes first too. It's a good way to keep motivated. Good luck with all your UFOs. I look forward to seeing some finished projects before the year is up. Your list looks like mine .only got 3 of my list done last year. Good luck, hope to see lots of finished things in 2012. Hi Gail. I joined Sew It's Finished last year, I have a LOT of UFO's- maybe not quite as many as you, but I kept forgetting to make a list of them all. Wendy and I both agreed to do it asap this year, so I will be putting my list up this week. In the meantime I finally finished the stitchery/wallhanging for my grandsons wife, that I started in very early 2011, on Thursday last week, so I am trying to spur myself on to more finishes. You have certainly set yourself a challenge. Good luck and you are off to a flying start. Fabulous idea to list these the way you have. I'm like you and have so many items unfinished. I have a list - but I'm sure it is not complete! But I'm on a "let's get it done" roll as well. We will be moving at the end of the year and I need to have lots completed by then for that reason alone!! Love the colours in your table runner. Cheers and good luck with your plans. I did the same thing and hope to do better this year. I shouldn't even take on any new projects. My unfinished ones will probably take me a couple of years to complete. 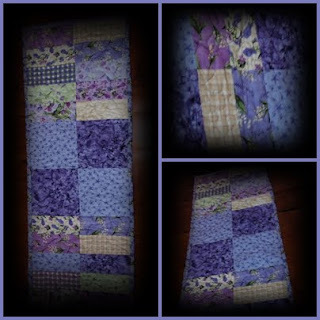 Love your table runner in Violet Wishes, I have a wall hanging in this fabric, one of my favourite ranges by Ro Gregg. Only 26 UFO's? I had more then 100 last time I listed them ... and that was a couple of years ago ! I probably should get out the list and see what I can finish this year. You're doing so well finihsing off your UFOs. The table runner is gorgeous, love the colours. Lovely the table runner Gail. Good luck with your ufo's. I haven't been game to count mine as yet.